I decided these Te Anau pea seedlings needed to get into the ground today and I needed something for them to grow on. A quick trip over the the bamboo and I clipped of a few of the newer growth shoots – still nice and flexible and created this little arch by simply pushing several inches of the saplings into the ground. If I feel it’s not holding up I might pop out and tie the center area together but I think it will be fine. 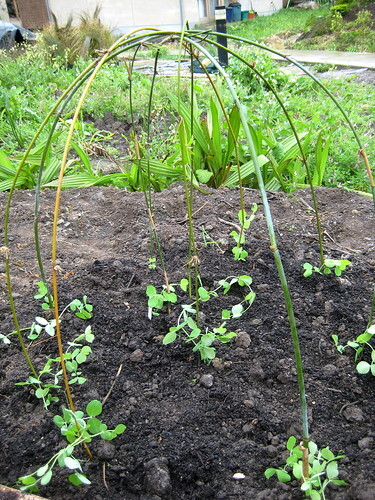 The idea is that the peas will grow up and over the arch making a serviceable and attractive trellis for them.